The Hand Held ScanTeam ST 2000 C-1 has been discontinued. No direct replacement is available. The ScanTeam ST 2000 C-1 is a compact rugged keyboard wedge that transmits decoded barcode magnetic stripe and MICR data to a variety of terminals and PCs by emulating keyboard-terminal communications. This product supports the full range of Hand-Held brand contact and non-contact barcode scanners as well as magnetic stripe and MICR readers. The ScanTeam ST 2000 C-1 can be interfaced with a variety of PCs and terminals and a bi-directional auxiliary port allows integration of RS-232 devices such as scales gauges portable data collection terminals and printers. ScanTeam ST 2000 C-1 series products are fully programmable via an easy-to-use barcode menu and the advanced data formatting feature provides a powerful editing facility for optimal performance and compatibility with existing application systems. The ScanTeam ST 2000 C-1 is a compact, rugged keyboard "wedge" that transmits decoded barcode, magnetic stripe, and MICR data to a variety of terminals, PCs and/or POS devices by emulating keyboard/terminal communications. The product supports the full range of Welch Allyn contact and non-contact barcode scanners (wands, CCDs, and lasers), magnetic stripe, and MICR readers. 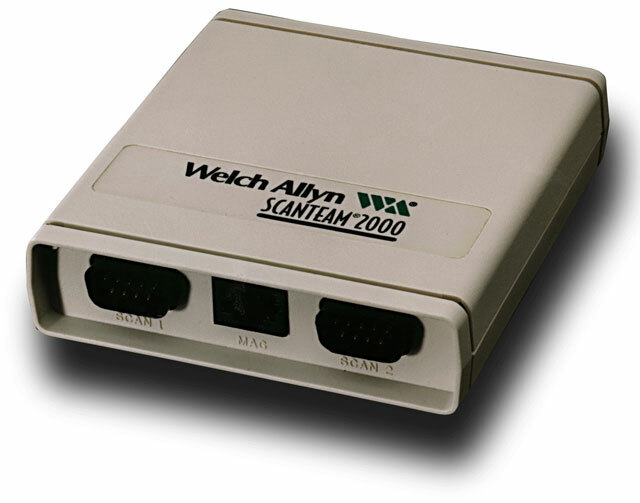 The ScanTeam ST 2000 C-1 can be interfaced with a variety of PCs and terminals, including IBM, DEC, HP, WYSE, NCR, Nixdorf, and Fujitsu. A bi-directional auxiliary port allows integration of RS-232 devices (e.g., scales, gauges, portable data collection computers, printers). ScanTeam ST 2000 C-1 series products are fully programmable via an easy-to-use barcode menu. The advanced data formatting feature provides a powerful editing facility for optimal performance and compatibility with existing application systems. The unique FLASH EPROM downloading and cloning features provide customers with access to new Welch Allyn software releases, extending the customer's investment to new applications and system requirements. Welch Allyn's industry leading Wide Band Decoding firmware delivers unmatched scanning and decoding performance for maximum throughput. The versatile SCANTEAM 2000 series products handle a wide range of data entry chores in manufacturing, office, and retail/POS applications. They can improve data accuracy and speed for document tracking, remittance processing, asset control, inventory tracking, work-in-process, shop floor control, time and attendance, and many other applications. Wide range of interfaces spans the retail and commercial wedge markets. Flexibility for new systems and applications. Small "footprint" eases implementation and reduces work area clutter. Support for barcode wands, lasers, CCD scanners, swipe readers, mag stripe and MICR readers provides maximum applications flexibility. New software releases can be downloaded, eliminating the need to ship and install conventional PROMS. Protects and extends customer investment. Two-way communications with RS-232 devices (i.e. printers, gauges, and scales) for flexibility in configuring system solutions. Can also be used as a serial wedge. Fast, accurate autodiscrimination of up to 13 codes at 3 to 50 inches/second. Instant interchange between keyboard, barcode, and magnetic stripe data input.